After more than fifteen years as a fitness freak, I’ve come to realize that not all protein bars are made equal. But how do you know which are the best protein bars? There are literally hundreds of brands on the market, e.g. 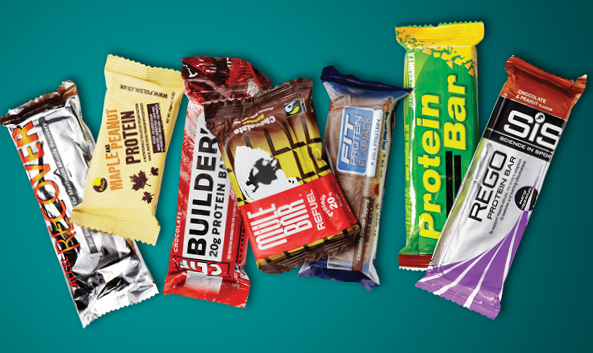 Kellogg’s, thinkThin,Detour, Premier or Clif Bar Builder’s – all with their own take on what a protein bar should be. It’s easy to get sidetracked by catchy taglines and clever marketing campaigns. I’ve made this article specifically for those, like me, who want more out of their protein bar. A good protein bar is more than just the nutritional facts on the back of the wrapper. Qualities like taste, price, performance and quality all matter, and they’re all part of gauging the best protein bars from the mediocre ones. Gluten free protein bars are excellent if you are sensitive to gluten. They are made especially for people who suffer from Celiac Disease, a condition that makes gluten digestion harmful or even fatal. But these protein bars are great even if you don’t suffer from Celiac Disease. They are an excellent source of protein if you are someone who follows a gluten-free diet. These protein bars are rich in protein and highly nutritious. But they aren’t made with gluten based ingredients like wheat and barley. And since gluten free diets are now more popular than ever, you can expect to see more gluten free protein bars in the future. Meet the king of protein bars. The Quest Nutrition Double Chocolate Chunk Protein Bar tastes great and packs a lot of protein. But the best part is that it has absolutely no sugar. It serves up to 20 grams of protein in every bar, which is perfect if you want an all-around protein bar that is both healthy and tasty. The double chocolate chunk protein bar is one of the best tasting health snacks on the market. They are rich, creamy and packed with chocolate. But since they contain no sugar, you don’t have to worry about spikes in your sugar level. It’s also completely gluten free, so it’s an excellent snack even if you follow a strict gluten-less diet. Every bar comes with 16 grams of fiber, which is a lot for a protein bar. The only drawback is that it contains the artificial sweetener stevia in place of sugar. While it’s healthier than refined sugar, it’s still something to avoid if you don’t like artificial sweeteners in your body. But that’s a minor drawback with the amount of nutritional value you’re getting in every bar. The Quest Nutrition Protein Bar, Double Chocolate Chunk is high in protein, high in fiber, and very high on taste. What more could you ask for from a protein bar? The KIND Peanut Butter Dark Chocolate + Protein Gluten Free Bars aren’t made for people who want to bulk up their bodies. But if you’re a regular Joe or Jane who just wants to eat healthy, this might be the health snack for you. Not everyone has an active lifestyle, that’s why eating healthy is important. This peanut butter dark chocolate protein bar tastes great but is also very nutritious. Each bar comes with 7 grams of protein and 2.5 grams of dietary fiber. But it’s also made from all-natural, non-GMO ingredients. It’s doesn’t contain any hydrogenated oils and trans fat. It’s even gluten free. If you look at its ingredients, it’s easy to see why this is such a great health snack. There are a lot of protein bars to help you build muscle. But there are only a few health snacks that are tasty, nutritious and all-natural. This Kind protein bar is a one-of-a-kind health snack that tastes great despite having all-natural ingredients. So many other protein bars are made for people with healthy, active lifestyles. But this protein bar is excellent if you want to eat healthy even if you don’t have time to work out. 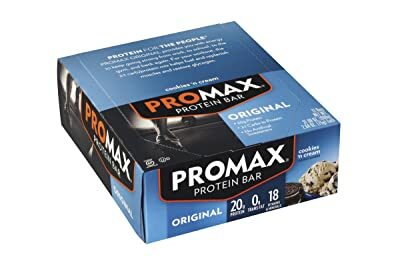 The Promax Protein Bars Cookies n Cream are a sucker punch of protein. Each of them delivers 20 grams of protein per serving and tastes great. It may not work well as a weight loss snack because of its high-calorie content, but it works very well as a meal replacement. The Promax Protein Bar is a great tasting health snack designed to fuel your body after an intense work out. Unfortunately, it doesn’t have much dietary fiber. It also suffers from a high carb count. But because it’s a gluten free protein bar, it’s great if you’re gluten intolerant. Each bar comes with 30 grams of sugar. This can be a problem if you want to keep your sugar low. But because Promax protein bars doesn’t use artificial sweeteners, they taste better than a lot of other protein bars. Taste wise, the cookies n’ cream flavor is rich and satisfying. The Cookies ‘n Cream flavored Promax Protein Bar is a no nonsense protein supplement. It may fall short on nutrition, but it doesn’t come up short on protein or taste. 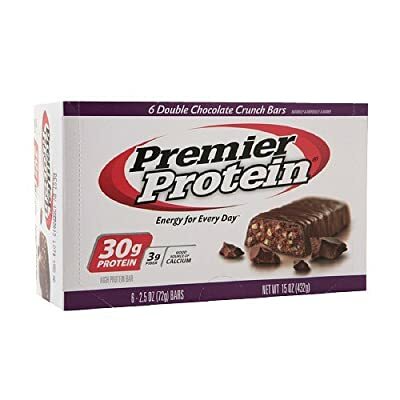 These Premier Nutrition protein bars are a great source of fiber and protein. And because of their peanut butter flavor, they also taste great. They’re an excellent health snack if you want the creamy taste of peanut butter without the empty calories. 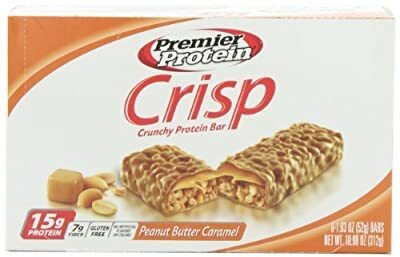 Each bar of the Premier Nutrition Protein Crisp Bars, Peanut Butter Caramel comes with 15 grams of protein and 7 grams of dietary fiber. And at only 200 calories per serving, you get a lot of protein for such a small amount of calories. They’re also gluten free, which is great if you are sensitive to gluten. Each bar uses real roasted peanuts to capture that authentic nutty flavor. But it also has 7 grams of sugar per serving, so you shouldn’t eat too much of this if you’re careful about your blood sugar. But since it has no artificial flavors, you also shouldn’t worry about any chemical aftertaste. The Premier Nutrition protein bars are tasty and nutritious. They supply a lot of protein for without loading you with calories. But they are also a great source of dietary fiber. These Premier Nutrition protein bars are perfect if you want to add a lot of protein to your diet. They’re great if you want to build mass and muscle. They’re also great recovery snacks after a very intense workout. Each of the Premier Nutrition Protein Double Chocolate Crunch Bar comes with a whopping 30 grams of protein. And although 280 calories may sound like a lot, that’s very small compared to the amount of protein you’re getting. But to top that all off, the double chocolate crunch flavor is one of the tastiest flavors from Premier Protein. Unfortunately, the Premier Protein Nutritional Bar, Double Chocolate Crunch has a very high amount of sugar at 10 grams per serving. So you should avoid this if you are careful about your sugar levels. But you’ll understand why when you taste the amount of chocolate in every bar. This Premier Nutrition protein bar packs a lot of taste with a lot of protein. It’s high on sugar, but it’s still a great source of protein if you want to help with hitting your daily protein goals. Sometimes a protein bar isn’t all about protein. This Think Thin Fiber Chocolate Almond Coconut Protein Bar packs both protein and fiber. It’s a great health snack if you’re looking for more than just protein in your diet. Each bar comes with 13 grams of protein and 5 grams of fiber. And since it’s made with 100% non-GMO ingredients, you know you’re adding all-natural ingredients into your body. These protein bars are also gluten free, so it’s an excellent snack if you’re sensitive to gluten ingredients. And since each box comes with 10 bars it also gives you great value for your money. Unfortunately, these thinkThin high fiber bars may not be as flavorful as other protein bars. But they are healthier than a lot of protein bars on the market. They may not be the best snack if you want to build muscle, but they’re a healthy alternative to sugary treats. The thinkThin High Protein Plus Fiber Bar is exactly what it says it is. It delivers protein with a healthy serving of fiber. It’s healthy, natural and a great snack if you live a non-GMO, gluten free lifestyle. Low carb protein bars are the perfect snack for weight loss and muscle generation. Their low carbohydrate content helps keep your weight in check. And they also help in gaining mass and muscle. Gaining muscle is a great way of burning fat, that’s why low carb protein bars are an effective way of helping you shed extra pounds. But since they are filled with nutrient rich calories, they can help give you that full, satisfied feeling for long periods of time. Although low carb protein bars are hardly a substitute for a full meal, they can act as a healthy in-between snack. Who would’ve thought that brownies could be so nutritious? The Quest Nutrition Protein Bar Chocolate Brownie 12 Bars are low carb protein bars that are great if you love sweets. They are packed with nutrition and rich with chocolaty flavor. Each of them has 20 grams of protein and 19 grams of dietary fiber. And since they are low on carbohydrates, they are a great snack even if you’re trying to lose weight. They are an excellent diet or post workout snack. Unfortunately, they also contain sucralose, an artificial sweetener that causes blood sugar to spike. This can be especially problematic for diabetics. Despite being packed with nutrition, this chocolate brownie bar is dense and grainy in texture. It isn’t soft and creamy like a normal chocolate bar. Overall, the sucralose makes this protein bar difficult to recommend if you’re a diabetic. But if you aren’t conscious about your sugar levels, this chocolate brownie protein bar is a great way to meet your daily protein goals. It’s also an excellent diet snack since it isn’t packed with a lot of carbs. Whoever said that health snacks can’t be full of flavor? The Quest Nutrition Bars Chocolate Chip Cookie Dough is healthy and tastes great at the same time. It’s packed with chocolate chip cookie dough flavor and filled with vitamins and minerals. It’s a fantastic post workout snack, but it’s also a delicious midday treat. Every bar comes with 20 grams of protein. But since it’s also sugar-free, you don’t have to worry so much about your blood sugar. It’s also gluten free, which makes it a great snack even if you’re gluten intolerant. 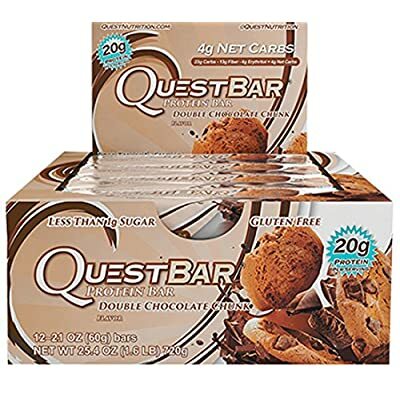 The Quest Nutrition Bars Chocolate Chip Cookie Dough Flavor contain stevia. So you should watch out if you’re trying to avoid artificial sweeteners. But if you don’t mind the artificial sweetener, then these protein bars are a healthy, great tasting protein-rich supplement. It’s the closest thing to guilt-free chocolate chip cookie dough you’ll ever get. Thankfully, they’re also the perfect balance between nutrition and taste. Apple pies may not be the healthiest snacks in the world but Quest Nutrition aims to change that. Their Quest Low Carb Protein Bar – Apple Pie is low carb but high in protein. This makes them great for weight loss but even better for muscle generation. Each box comes with 12 protein bars. Each bar is packed with 20 grams of protein, 19 grams of dietary fiber, and absolutely no trans fat. It’s a great midday snack to keep your metabolism going. It also doesn’t fill your body with empty calories. And since Quest protein bars are gluten free, it’s a great health snack if you’re sensitive to gluten. Like most health snacks, this particular apple pie variant lacks the flavor real apple pie. And because it’s made with the artificial sweetener called sucralose, it’s not good if you have high blood sugar. As a protein bar and health snack, the Apple Pie flavored Quest Protein bar delivers on the nutritional front, but for individuals looking for richer flavor, the cookie dough and chocolate brownie variants could prove to be more satisfying. Low sugar protein bars are a great health snack if you’re pre-diabetics, diabetic or simply want to cut down on your sugar intake. Because of their low sugar content, low sugar protein bars are excellent at helping you maintain or lose weight. Sugar is an effective energy source for the body, but a high amount of it can lead to a variety of heart conditions. In fact, sugar (usually in the form of fructose) provides no tangible nutritional content which often leads to empty, fattening calories. That’s why low sugar protein bars are great at cutting out sugar while giving you a good dose of protein at the same time. 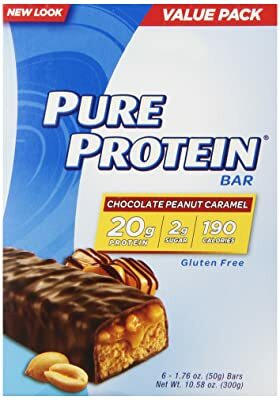 The Pure Protein Chocolate Deluxe High Protein Meal Replacement Bar is a great health snack if you want to increase your protein intake without increasing your sugar levels. It’s great for sports enthusiasts or high-intensity athletes. Every protein bar is loaded with 32 grams of protein, which is far higher than the average protein bar. And since each 12 pack is affordably priced, it comes out substantially cheaper than competing brands. The Pure Protein High Protein bar gives you tremendous value as both a protein supplement and as a meal replacement. While not completely sugar-free, the Pure Protein Bar still keeps the sugar count low at an impressive 4 grams per serving. Unfortunately, those looking for a truly rich chocolate taste might want to look elsewhere for their sweet cravings. The high-calorie content also makes it a tough sell if you are particular at keeping your calories count low. The Pure Protein High Protein Bar is alow sugar protein bar that packs a wallop of protein at 32 grams per serving. It’s a great pre or post workout snack. And while it lacks in rich chocolate taste, it makes up for it with low-sugar and high-protein content. The Pure Protein Chocolate Peanut Caramel Value Pack definitely lives up to its name. It’s affordable but still rich in protein. And at only 190 calories per protein bar, it’s perfect for weight watchers and calorie counters. This value pack comes with 6 individually wrapped protein bars. It offers great value for money compared to other protein bars. Each bar is packed with 20 grams of protein but still has a remarkably low amount of sugar at 2 grams per serving. But because of its low sugar content, Pure Protein bars rely on artificial flavoring. This can leave an overwhelming chemical aftertaste. Even then, these protein bars still have that familiar peanut caramel taste found in a lot of popular chocolate bars. And because they’re 100% gluten-free, they’re a great snack if you’re sensitive to gluten. Overall, the Pure Protein Value Pack is an affordable, low sugar health snack. It’s a great way of hitting your daily quota of protein without breaking your bank account. It provides good value for money but is still very nutritious. 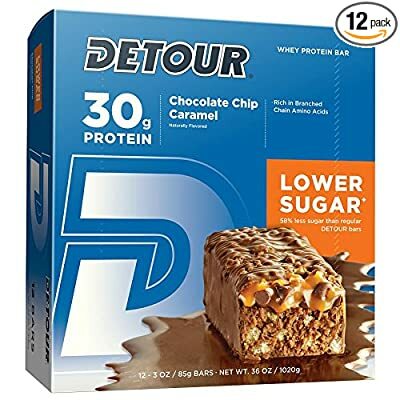 The Detour Lower Sugar Chocolate Chip Caramel Nutrition Bar is a tasty and healthy alternative to more common sugar-rich chocolate bars. Its chocolate chip caramel flavor stands up to even the tastiest of chocolate snacks. But since each bar packs a very high amount of whey based protein, it’s also a great post work-out treat. With 30 grams of protein in every serving, the Detour Lower Sugar Nutrition Bar is an effective protein supplement to help with muscle gains. And because of its nutrition content, it helps ward off those annoying hunger pangs between meals. But despite its name, the Detour Lower Sugar Nutrition Bar still contains a substantial amount of sugar at 5 grams per serving. This amount isn’t harmful by any means, but this bar should not be mistaken as a low sugar substitute. The Detour Lower Sugar Nutrition Bar provides a high amount of protein. It is perfect if you’re bulking up and building muscle. But if that’s not enough protein for you, there is also the Detour Lean Muscle Nutrition Bar. It delivers even more protein and even less sugar per serving. Simply Protein is known for their soy based protein bars. However, their whey based protein bars offer an excellent non-soy source of protein. At only 15 grams of protein per serving, this low sugar protein bar doesn’t quite stand up to more protein loaded supplements. But if your workouts are minimal or non-intensive, 15 grams of protein is more than enough for a midday snack. Its low sugar content makes it an ideal health food for diabetics. At the same time, its low carb count helps you keep off any extra weight you’re afraid of piling on. Unfortunately, the Simply Whey Chocolate Mint Protein Bar relies heavily on artificial flavors. This is because of its low sugar count. Its chocolate mint flavor is still noticeable, but its artificial taste can be bothersome if you’re looking for the rich, full taste of mint chocolate. Either way, Simply Protein Whey Bars are a great alternative if you don’t like soy based protein bars. It’s great if you’re weight conscious or if you want a filling midday snack to ward away the hunger pangs. Vegan Protein Bars are made with no animal byproducts like dairy, eggs or honey. They usually rely on soy and casein for their protein while other protein bars rely on whey protein isolates. But these protein bars deliver just as much protein as their whey based counterpart and are a great source of protein if you’re following a strict vegan diet. But vegan protein bars also a great source of protein if you can’t have dairy or eggs. However, even without milk, eggs or honey, they can taste just as good and be just as nutritious as non-vegan protein bars. Building muscle has never tasted this good. The Clif Bar Builder’s Chocolate Mint protein bars are a great snack after an intense work out. They’re designed for high energy athletes like marathon runners, body builders and triathletes. Since each bar is packed with 20 grams of protein, it’s a great way of keeping you full and satisfied in between meals. But because of the high sugar content, these protein bars may not be good for you if you’re diabetic or if you’re careful about your sugar levels. Thankfully, these chocolate mint flavored protein bars taste great. Clif Bar Builder’s protein bars contain 23 essential vitamins and minerals including iron, calcium, vitamin C and A. They also provide that chocolate mint flavor that isn’t common in other protein bar brands. And because they’re so nutritious, they can even be used as a meal substitute after an intense workout. Clif Bar Builder’s protein bars are a great and tasty source of protein. Despite its high sugar content, it’s an excellent health snack if you want to get the most out of your work outs. The Clif Builder Bar Chocolate Peanut Butter protein bar is a great post work-out snack. It is designed to help build muscle after an intense work out. It’s made especially for high-intensity athletes and sports enthusiasts. But it’s also a healthy way of satisfying your chocolate peanut butter cravings. Each bar is loaded with 20 grams of protein and 23 essential vitamins and minerals like iron and calcium. It’s an effective protein supplement but also a delicious health snack. And since it’s free of high fructose corn syrup, you don’t have to worry about any artificial aftertaste. But because it’s high in sugar, it’s not very good if you’re diabetic. Since these protein bars have a low glycemic index, they take longer to digest. This means that you get that full, satisfied feeling hours after you’ve eaten them. They’re perfect for warding off hunger pangs after an intense work-out, especially when your body is still burning extra calories. Clif Bar Builder’s protein bars are both a nutritious and delicious source of protein. And these chocolate peanut butter flavored bars are no different. Out of all the Clif Bar Builder’s protein bars, this protein bar has to be the best tasting one. Packed with a rich peanut butter taste, the Clif Bar Builder’s Crunchy Peanut Butter protein bar is great if you lead an active lifestyle. Every bar is loaded with 20 grams of protein. And because of its low glycemic index, it takes longer to digest, making you feel full for longer periods of time. But the great thing about this protein bar is that it doesn’t trigger peanut allergies even if it is peanut butter flavored. But people who don’t want to rely on soy protein should avoid this bar. The Clif Builder Crunchy Peanut Butter Protein Bar uses soy isolates instead of whey protein. And because each bar packs 23 grams of sugar, this snack can also be a problem if you’re diabetic or careful about your blood sugar. But all in all, this crunchy peanut butter protein bar from Clif Builder’s is one of the best on the market. It delivers a rich, crunchy peanut butter flavor without triggering your peanut allergies. And it’s packed with high amount of protein to fuel even the most intense of workouts. The Simply Bar Cinnamon Pecan is a great health snack for both vegans and weight watchers. Each of these vegan protein bars comes with 16 grams of protein at just 160 calories each. But it’s also low on fat with just 1 gram of fat per serving. Simply Protein Bars are 100% vegan and gluten free, using ingredients like vegetable glycerin and organic cocoa for flavor. But because these protein bars don’t use dairy, they can unfortunately be very dry in texture. This can be a turn-off if you like protein bars that are rich and creamy. However, their low fat and glycemic content make Simply Protein Bars great for diabetics or if you are conscious about your sugar levels. This Cinnamon Pecan protein bar provides a rich, nutty taste. But it also doesn’t use a lot of sugar. And because of its low sugar and calorie content, it’s perfect for weight watchers. The Simply Protein Bar is a nutritious, all-around health snack that’s perfect if you’re vegan, sensitive to gluten, or diabetic. But it’s also a great diet snack because of its low-calorie content. The Probar Peanut Butter Chocolate Protein Bar might be one of the tastiest vegan protein bars on the market. Since it’s 100% vegan, it’s made without any milk or dairy. But that doesn’t get in the way of its creamy, peanut butter chocolate flavor. Each serving is loaded with 21 grams of soy protein. This makes it a great source of protein if you want more protein without eating meat, milk or eggs. And because all the ingredients are organic and non-GMO certified, you can be sure that these protein bars are made from all-natural ingredients. Unfortunately, these protein bars are also high in calories and carbohydrates. If you’re trying to lose weight, this might not be the best diet snack for you. But if you’re into intense exercise, this is a great snack to refuel your body. The Probar Base Protein Bar is a tasty and protein rich health snack. It’s excellent if you follow a vegan diet or if you simply want an all organic protein bar. Clif Bar Builder’s protein bars are made to help you get the most out of your body. If you’re into intensive training and proper nutrition, these protein bars are perfect for you. These protein rich snacks help build and recover weary muscles. It’s great for triathletes, marathon runners and even body builders. Detour Protein Bars are a convenient and healthy, on-the-go snack. They provide lots of protein without the empty calories. But Detour’s extensive line of protein bars is more than just tasty health snacks. They offer everything from low sugar to ultra-high protein health bars. Detour also supplies a wide range of health foods. They offer products like lean muscle milkshakes and gluten free, whole grain oatmeal bars. Detour is all about mixing taste and nutrition. Owned and manufactured by Forward Foods, Detour delivers that perfect balance of performance and taste in all its products. Kellogg’s Special K Protein Bars are designed as a meal substitute or midday snack. Each bar is packed with protein and fiber. They satisfy hunger by providing nutrients and healthy calories.Kellogg’s Special K Protein Bars are made by Kellogg’s, a company known for its cereal brands. And like cereal, these protein bars are made to be both convenient and satisfying. These Kellogg’s Special K Protein Bars come in a variety of flavors. But they all satisfy hunger pangs by providing high amounts of protein and nutrients. All in all, they are a great way of keeping you healthy while helping you stay on-the-go. Premier Protein Bars are perfect if you are athletic or sports-minded. They’re designed to give you more protein without the need to eat a full meal. That means more protein but less empty calories. They come in a variety of flavors. But they also come in an assortment of mixes that deliver on everything from high protein to high fiber. thinkThin protein bars are perfect for weight conscious individuals who don’t want to sacrifice taste for health. They are completely gluten free and made from 100% non-GMO ingredients. This makes them great snacks if you’re sensitive to gluten ingredients like wheat and barley. Despite their image as a diet bar brand, thinkThin believes that overall wellness is more than just weight loss. It means eating well and living well, and that’s exactly what the thinkThin brand aims to showcase with the quality of their products. 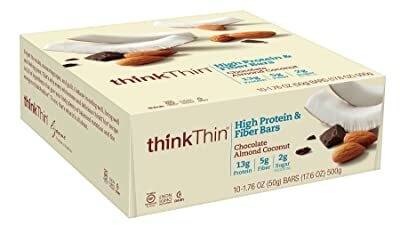 Outside of their traditional high protein bars, thinkThin offers other health snack bars that are rich in fiber and lean protein. Wow, what a great review article on protein bar! Thank you for sharing all this info with us!! !